Why RJ Hair Extensions Are Different From Other brands? ~ RJ Hair is available in over 25 colors; offering a vast variety of standard colors ranging from subtle natural browns to a wide range of blonde tones to intensely wild trending colors. ~ For the ultimate desired shade, we offer our custom mixed blends colors. ~ RJ Hair Extensions are made with a multi-tone coloring technique in every color. When you choose your set, even if your hair color is slightly different, RJ Hair Extensions will blend amazingly and still look so natural. ~ All colors stand out with their distinguished fade resistance and brilliance. ~ RJ Hair Extensions are double drawn and full from top to bottom. This means that most of the hair strands are the same length and there are evenly distributed amounts of volume from top to bottom. ~ This is an important quality feature and application advantage since the stylist will need less hair strands of extensions to achieve a better overall thickness. This will let you keep 85% to 90% of your hair free of extensions; therefore, your hair will maintain its healthy and safe quality while using semi-permanent extensions over years. Having fewer extensions in your hair will be easy to cover up with your own hair when wearing a high ponytail or an up style. ~ We only work with the best and highest quality 100% real healthy Human Hair that has the hair cuticles kept intact. The real hair is collected from all over the world in adherence with strict ethical principles. RJ Hair is simply the very best from around the world. ~ RJ Hair stands out for its perfect shine and natural elasticity. The competitors’ hair on the other hand is mostly composed of extremely damaged hair and exposed surfaces as a result of chemical treatments. This is of great significance in terms of the quality of hair lengthening, since hair without a healthy surface has little shine and elasticity and tends to become matted easily. ~ Intricate and laborious sorting and refinement processes are used to produce human hair lengthening and thickening products with the brilliant natural shine, elasticity and bounce, characterizing real RJ Hair. ~ Our hair quality lives up to even the highest expectations of stylists and clients. Our top quality hair remains unsurpassed in quality and is known for its legendary reputation among top-stylists all over the world. ~ RJ Hair is unparalleled, premium hair quality. Therefore, every single hair strand is hand-selected according to stringent quality criteria. With extremely demanding precision. Only the best and healthiest hair strands are used for all “RJ Hair Creations”~ With the same tenacity, every hair product is closely examined before leaving our factory. Provided that the hair has been properly cared for, RJ guarantees that the quality of RJ Hair will be maintained during the entire wearing period. ~ The hair is lightened using an elaborate 24-hour process and then colored until the desired shade is attained. ~ Top-quality, brilliant hair with amazing elasticity, a natural feel as well as comfortable and natural wearing comfort. Suitable for all types of hair. 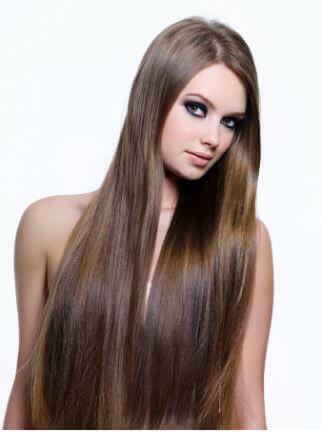 ~ RJ Hair keeps its natural healthy, silky shine and bounce – as perfect as on the first day!